Send us a current picture! Moved to Laguna Beach in 1969. Lived and skied in Aspen, early 70's, then returned to live Laguna. Later in the 70's spent a year in Poipu and the Na Pali Coast, again returning to Laguna. By the 80's my business was going strong and I become involved in local government. Later I was appointed as a Planning Commissioner. In '93, still involved in local government, my home in Laguna burned to the ground in the Great Laguna Beach Fire. Around this time I met Melinda, truly love at first sight and LOVE of my life. By '95 we were married in our newly built home. In '99 our son Dev was born. The business continued to grow which included clients like the NASCAR SPEEDWAY and STAPLES Center downtown L.A. In '07 we moved our family for quality of life issues from Laguna Beach to Aptos on the Monterey Bay. I sold the business but continued to mentored it for an additional two years, flying from San Jose to O.C., spending four nights a week with my family on the Monterey Bay and three nights a week in our Laguna Beach home. Today we have a peaceful life together on the Montery Bay with the sounds of waves in the air and the Redwood forests at our back. Our son loves attending Mount Madonna School,a main factor of why we moved here. Each year the junior and senior class fly internationally.For example,India to interview the Dalai Lama and South Africa to interview the late Nelson Mandela. Each year K-12 performs the epic Ramayana play. A tale of drama, dance and song regarding the human condition and the spiritual quest. Best regards, Jeff. 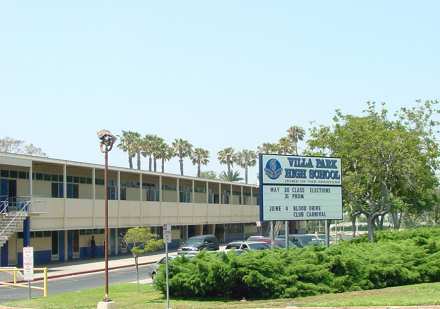 It is a product of Classreport, Inc. and may not be affiliated with Villa Park High School or its alumni association.